To Cite: Nugroho A M, Sugiarto A, Chandra S, Lembahmanah L, Septica R I, et al. A Comparative Study of Fractionated Versus Single Dose Injection for Spinal Anesthesia During Cesarean Section in Patients with Pregnancy-Induced Hypertension, Anesth Pain Med. Online ahead of Print ; 9(1):e85115. doi: 10.5812/aapm-85115. Objectives: This study aimed to compare the mean arterial pressure (MAP), the total dose of ephedrine required, and level of sensory blockade between the fractionated-dose and single-dose spinal anesthesia injection in obstetric patients with pregnancy-induced hypertension who underwent a cesarean section. Methods: This single-blind randomized clinical trial was conducted from January to April 2018 after being approved by the Research Ethics Committee of Universitas Indonesia (No. 1174/UN2.F1/ETIK/2017) and recorded at ClinicalTrials.gov (NCT03693638). After obtaining informed consent, 42 parturients with hypertension in pregnancy (gestational hypertension or preeclampsia), ASA II-III, aged 18 - 40 years, and BMI of 18.5 - 35 kg/m2 with singleton pregnancy, who were planned for spinal anesthesia for emergency or semi-emergency cesarean section with hyperbaric bupivacaine 0.5% (MarcaineTM, Hospira) and fentanyl, were included in this study. All subjects were randomly divided into two groups including fractionated-dose (FD) and single-dose (SD). Results: There was no significant difference between the two groups in MAP in the first 15 minutes after anesthesia (P > 0.05) and median total dose of ephedrine required (10 (0 - 25) mg in the FD group vs. 15 (0 - 30) mg in the SD group, P = 0.30). However, in the FD group, MAP tended to be higher in the first three minutes compared to the SD group. The level of sensory blockade was mostly at T4, which was not significantly different between the groups (52.4% in FD vs. 42.9% in SD, P = 0.59). Conclusions: In obstetric patients with pregnancy-induced hypertension who underwent a cesarean section, the mean arterial pressure after spinal anesthesia was not significantly different between the fractionated dose of spinal anesthesia injection and single-dose injection. Total ephedrine required and levels of sensory blockade were not significantly different between the groups. Hypotension during spinal anesthesia, due to sympathetic block, is one of the most common complications of spinal anesthesia, with an incidence varying from 69 to 90% (1-3). Sudden drop in blood pressure can affect the mother and fetal well-being, especially in patients with preeclampsia (4, 5). In spinal anesthesia, severe preeclampsia patients have six times lower risk of hypotension (16.6%) and less total ephedrine use compared to normal obstetric patients. However, slightest drop in blood pressure still affects uteroplacental blood flow and causes hypoxia and acidosis in the fetus (6). Moreover, hemodynamics of patients with preeclampsia are harder to predict due to unpredictable intravascular volume status and severity of disease (7). One of the feasible ways to prevent hypotension effects caused by spinal anesthesia in patients with hypertension is modifying the regimen or technique of administering hyperbaric local anesthetics intrathecally (2, 6, 8). Dividing the dose of local anesthetic drugs injected into spinal subarachnoid space in certain time intervals can result in more stable hemodynamics and longer analgesia duration compared to a single dose (8). The aim of this study was to compare MAP changes, the total dose of ephedrine required, and level of sensory blockade between fractionated-dose and single-dose spinal anesthesia injection in obstetric patients with pregnancy-induced hypertension who underwent a cesarean section. This was a single-blind randomized controlled trial conducted in the Tangerang District General Hospital from January to April 2018. We obtained approval from the Research Ethics Committee of Universitas Indonesia (No. 1174/UN2.F1/ETIK/2017), recorded at ClinicalTrials.gov (NCT03693638). After informed consent was obtained, we included 42 parturients with hypertension in pregnancy (gestational hypertension or preeclampsia), ASA II-III, aged 18 - 40 years, and BMI of 18.5 - 35 kg/m2 with a singleton pregnancy, who were planned to undergo spinal anesthesia for emergency or semi-emergency cesarean section. All subjects received spinal anesthesia with 2.5 mL of 10 mg hyperbaric bupivacaine 0.5% (MarcaineTM, Hospira, USA) and fentanyl 25 mcg. Patients with chronic hypertension, eclampsia, pulmonary edema, cerebrovascular diseases, type-2 diabetes mellitus and gestational diabetes, placental abruption/previa/accreta, umbilical cord prolapse, gestational age of < 34 weeks, estimated fetal weight of ≤ 2,300 grams and ≥ 4,000 grams, polyhydramnios, and fetal distress were excluded from the study. Subjects were randomly divided into two groups including the fractionated dose (FD) group that received initially 1.5 mL of total dose followed by 1 mL remaining dose after a 90 s interval, and the single-dose (SD) group that received the total dose of bupivacaine 0.5% and fentanyl in one injection. After IV cannulas (18 - 20 G) were properly placed, premedication with intravenous (IV) ranitidine 50 mg and metoclopramide 10 mg was given. Additional IV access was used if MgSO4 would be continuously administered intravenously during surgery. Standard monitor devices were placed after patients being transferred to the operating room. Additional premedication such as intravenous midazolam 0.02 mg/BW or fentanyl 1 mcg/BW was given if the patients were anxious or in pain. The baseline hemodynamic measurement was done two minutes after premedication. Spinal anesthesia was performed while the patients were in the sitting position at L3-4 or L4-5 level with a median or paramedian approach, with a total dose of 2.5 mL of 10 mg hyperbaric bupivacaine 0.5% and fentanyl 25 mcg. After skin wheal of lidocaine was placed at the intended spinous interspace, a spinal needle (SpinocanR, B Braun, Germany, 27 G) was inserted and advanced until subarachnoid space reached. In the FD group, 1.5 mL of the total dose was given, followed by 1 mL remaining dose after a 90 s interval. In the SD group, the 2.5 mL total dose was given at 0.2 mL/second, and subjects were asked to remain sitting for 90 seconds. If there were more than three injection attempts, the patients were excluded from the study. Co-loading 5 - 10 mL/kg ringer lactate was given in 20 minutes for all subjects. Patients were positioned in the supine position to give oxygen 3 L/min. ECG, heart rate, MAP, and oxygen saturation were measured every three minutes and the total dose of ephedrine and duration of surgery were recorded, as well. Hypotension was defined as a drop in blood pressure more than 20% of the baseline value that was treated with ephedrine 5 - 10 mg intravenously, which could be repeated if necessary. The sensory block was confirmed using the pinprick test, and motoric block with the Bromage scale. Sensory block levels were recorded every two minutes until the maximum block height reached. Patients were given oxytocin drip and/or intravenous methylergonovine after babies were born. APGAR scores were recorded in the 1st and 5th minutes. Data analysis was performed using Statistical Package for the Social Sciences (SPSS) version 20 for Windows. The data were analyzed using the general linear model (GLM), chi-square/Fisher, and Mann-Whitney U tests. There were 42 subjects recruited in this study with 21 subjects in each group, as shown in Figure 1. The characteristics of the subjects are shown in Table 1.
a Values are expressed as mean ± SD or No. (%). If the distribution is not normal, data are presented in median (minimum - maximum). a Values are expressed as median (minimum - maximum) or No. (%). There was no significant difference between the two groups in sensory block level (P < 0.05) (Table 2). GLM multivariate test showed that there was a significant difference in MAP for each measurement time (P < 0.05) (Table 3). There was no significant difference in MAP between the two groups at each measurement time (P > 0.05). 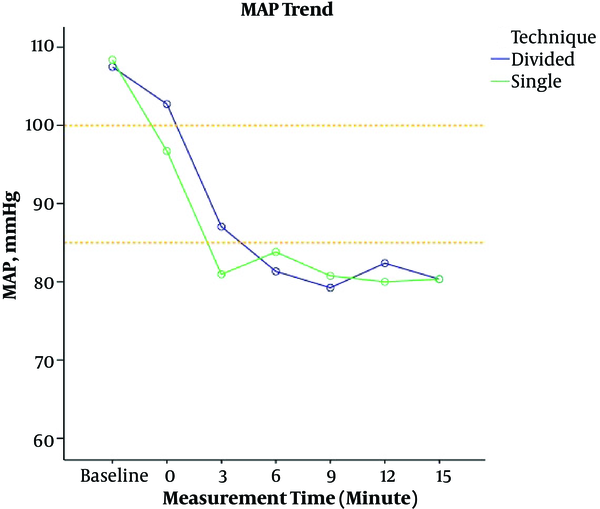 Figure 2 shows the MAP trend in the two groups at all measurement times. MAP in the first three minutes tended to be higher in the FD group than in the SD group although it was not statistically different. a Values are expressed as median (minimum - maximum). There was no significant difference in the total ephedrine required between the two groups (P > 0.05) (Table 4). There were 16 subjects (76.2%) in the FD group and 20 subjects (95.2%) in the SD group who suffered from hypotension, treated with ephedrine. This study aimed to compare the MAP, the total dose of ephedrine required, and level of sensory blockade between the fractionated-dose and single-dose spinal anesthesia injection in obstetric patients with pregnancy-induced hypertension who underwent a cesarean section. The results of the study showed that the two groups had similar baseline blood pressure. The APGAR score in the 1st and 5th minutes was also similar between the two groups, showing that both techniques gave good outcomes to the baby. The majority of the patients were severe preeclampsia patients (71.4% in the FD group and 76.2% in the SD group, Table 1). After spinal anesthesia injection, the MAP was not statistically different between the groups (Table 3). In preeclampsia, there are excessive vasoconstriction and increased vascular resistance due to the excessive inflammatory response to pregnancy. The activation of granulocytes, the increased release of inflammatory cytokines such as tumor necrosis factor-α, abnormal activation of the clotting system, and complement system play important roles in this regard (6, 9). In both group, more than two-thirds of subjects suffered from severe preeclampsia. Despite the sympathetic block due to spinal anesthesia, because of severe vasoconstriction, these subjects could still maintain their vascular tone that caused only a limited decrease in MAP. Post-spinal hypotension in severe preeclampsia subjects is not severe enough, so the divided dose of local anesthetics injection had a limited effect here. The divided dose of local anesthesia injection might be beneficial in patients with a high risk of hypotension or severe hypotension post-spinal anesthesia. Hemodynamic changes are also affected by other factors, which were difficult to control in our study, such as the duration and severity of pre-eclampsia, intravascular fluid volume or antihypertensive drugs, and concurrent unidentified medical problems such as chronic hypertension and peripartum cardiomyopathy. Although MAP was not significantly different between the groups in this research, there might be a change in other hemodynamic parameters. MAP is not the only modality to measure hemodynamic changes. Hemodynamic changes could be measured with cardiac output, systemic vascular resistance, or organ perfusion changes. MAP is part of afterload that affects stroke volume and cardiac output. There are also other factors contributing to cardiac output such as preload, contractility, and heart rate. In untreated patients with severe pre-eclampsia, the hemodynamic findings are characterized by high systemic vascular resistance (SVR), low left and right ventricular filling pressures, low to normal cardiac index (CI), and hyperdynamic left ventricular function. In those treated with IV fluids and/or antihypertensive, these findings could have normal to high SVR, elevated CI, and normal to high pulmonary capillary wedge pressure (PCWP) (10, 11). Although the APGAR score was not different between the groups, which might mark a good uteroplacental perfusion post-spinal injection, further research on hemodynamic modality changes in the divided dose of the local anesthesia group could be beneficial in certain obstetric populations. Total ephedrine dose given was not significantly different between the two groups. The increased sensitivity of vasopressors in preeclampsia patients might play a role here so that only was small doses of ephedrine needed to restore patient’s MAP (12). However, only were 16 subjects (76.2%) in the FD group given ephedrine, compared to 20 subjects (95.2%) in the SD group. The onset of the sensory and motoric blockade in two groups was similar (median FD group: 3 min (1 - 7), SD group: 3 min (2 - 5)). This might be due to the high total dose of hyperbaric bupivacaine 0.5% used in this study compared to other studies (8, 13). Higher doses of hyperbaric bupivacaine would distribute intrathecal anesthesia and could make distribution more widespread, irrespective of the methods of spinal local anesthetics injection (14, 15). In obstetric patients with pregnancy-induced hypertension who underwent cesarean section, mean arterial pressure after spinal anesthesia was not significantly different between the fractionated dose of spinal anesthesia injection and single-dose injection. Total ephedrine required and levels of sensory blockade were not significantly different between the groups. Authors' Contribution: Study concept and design: Alfan Mahdi Nugroho, Adhrie Sugiarto, Rafidya Indah Septica, and Laras Lembahmanah. Analysis and interpretation of data: Laras Lembahmanah. Drafting of the manuscript: Laras Lembahmanah and Annisaa Yuneva. Critical revision of the manuscript for important intellectual content: Alfan Mahdi Nugroho, Adhrie Sugiarto, and Susilo Chandra. Statistical analysis: Laras Lembahmanah. Conflicts of Interests: There are no financial conflicts of interest to disclose. Ethical Considerations: We obtained approval from the Research Ethics Committee of Universitas Indonesia (No. 1174/UN2.F1/ETIK/2017), recorded at Clinical Trials.gov (NCT03693638). Informed consent was also obtained. Funding/Support: The authors received no specific funding for this work. 1. Tsen LC. Anesthesia for caesarean delivery. In: Chestnut D, Wong C, Tsen L, Ngan-Kee W, Beilin Y, Mhyre J, editors. Chestnut's obstetric anesthesia: Principles and practice. 5th ed. Philadelphia: Elseviers Saunders; 2014. 2. Khaw KS, Kee WDN, Lee SW. Hypotension during spinal anaesthesia for caesarean section: Implications, detection prevention and treatment. Fetal Maternal Med Rev. 2006;17(2):157. doi: 10.1017/s0965539506001756. 3. Kurnia A. Faktor prognostik kejadian hipotensi pada Ibu Hamil yang menjalani operasi sesar dengan anestesia spinal [dissertation]. Jakarta: Universitas Indonesia; 2016. 4. Chumpathong S, Chinachoti T, Visalyaputra S, Himmunngan T. Incidence and risk factors of hypotension during spinal anesthesia for cesarean section at Siriraj Hospital. J Med Assoc Thai. 2006;89(8):1127-32. [PubMed: 17048420]. 5. Sharwood-Smith G, Drummond GB. Hypotension in obstetric spinal anaesthesia: A lesson from pre-eclampsia. Br J Anaesth. 2009;102(3):291-4. doi: 10.1093/bja/aep003. [PubMed: 19218369]. 6. Redman CW, Sargent IL. Pre-eclampsia, the placenta and the maternal systemic inflammatory response: A review. Placenta. 2003;24 Suppl A:S21-7. [PubMed: 12842410]. 7. Bateman B, Polley L. Hypertensive disorders. In: Chestnut D, Wong C, Tsen LC, Ngan-Kee W, Beilin Y, Mhyre J, editors. Chestnut's obstetric anesthesia: Principles and practice. 5th ed. Philadelphia: Elseviers Saunders; 2014. p. 825-52. 8. Badheka JP, Oza VP, Vyas A, Baria D, Nehra P, Babu T. Comparison of fractionated dose versus bolus dose injection in spinal anaesthesia for patients undergoing elective caesarean section: A randomised, double-blind study. Indian J Anaesth. 2017;61(1):55-60. doi: 10.4103/0019-5049.198390. [PubMed: 28216705]. [PubMed Central: PMC5296809]. 9. George EM, Granger JP. Recent insights into the pathophysiology of preeclampsia. Expert Rev Obstet Gynecol. 2010;5(5):557-66. doi: 10.1586/eog.10.45. [PubMed: 21170149]. [PubMed Central: PMC3001629]. 10. Ramanathan J, Bennett K. Pre-eclampsia: Fluids, drugs, and anesthetic management. Anesthesiol Clin North America. 2003;21(1):145-63. [PubMed: 12698838]. 11. Ramanathan J, Gill RS, Sibai B. Hypertensive disorders of pregnancy. In: Suresh M, editor. Shnider and levinson's anesthesia for obstetrics. 5th ed. Philadelphia: Wolters Kluwer Health; 2013. 12. Ngan Kee WD, Khaw KS, Ng FF. Comparison of phenylephrine infusion regimens for maintaining maternal blood pressure during spinal anaesthesia for Caesarean section. Br J Anaesth. 2004;92(4):469-74. doi: 10.1093/bja/aeh088. [PubMed: 14977792]. 13. Posangi I. Keefektifan anestesia spinal menggunakan bupivakain 0.5% hiperbarik 6 mg ditambah fentanyl 25 mcg dibandingkan dengan bupivakain 0.5% hiperbarik 7.5 mg pada bedah caesar [dissertation]. Jakarta: Universitas Indonesia; 2011. 14. Hocking G, Wildsmith JA. Intrathecal drug spread. Br J Anaesth. 2004;93(4):568-78. doi: 10.1093/bja/aeh204. [PubMed: 15220175]. 15. Maheshwari K, Naguib MA. Local anesthetics. In: Flood P, Rathmell JP, Shafer S, editors. Pharmacology and physiology in anesthetic practice. 5th ed. Philadelphia: Wolters Kluwer; 2015. p. 180-209.